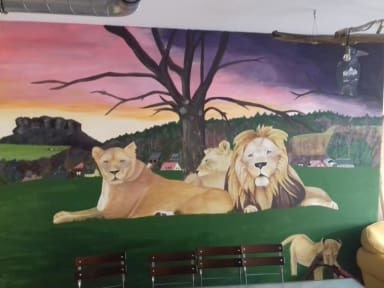 The 4Lions Hostel is a small family backpacker and hiker hostel located about 40km away from Dresden. There are single travelers and small groups and families. There is a lounge with kitchen, where you can cook together. We are happy to help with the preparations. Wi-Fi is available throughout the house. We are well connected to the urban infrastructure and public transport, especially the train station. Nevertheless, the adventure Saxon Switzerland starts only a stone's throw away. Near the river Elbe and climbing rocks. 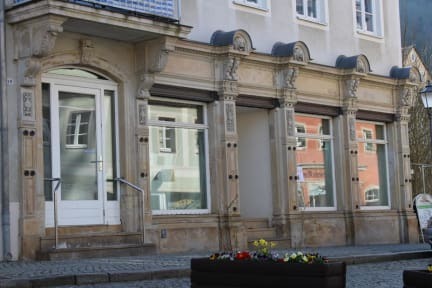 You walk in 7 min to the station (one stop to international connections, 35 min to Dresden), 5min to ferry (cross the river to reach national park especially Lilienstein, 3 min to bus stop (for example 3min to the big rock fortress), 3 min to the supermarket, ATM, snack, greengrocer, florist, 2 minutes to the pharmacy, general practitioner, post office, bicycle master workshop and bike rental, tourist information, restaurants, 15sec to bakery. We have simple rooms of different categories. Small rooms that can be used as a single or double room and also have a loft bed, so that parents with a child can stay there. There are also family rooms with private bathroom in the room. These rooms each have a double bed and several bunk beds. There is also a women's bedroom with en suite bathroom in the room, a mixed dorm and a trekking sleeping space where you can sleep in your own sleeping bag. All beds have a power outlet and a light. Breakfast not included but we do offer breakfast. Reception: 7:00 - 10:00 and 18:00 – 22:00. Minimum age 18. Children younger with parents. 16-18 is allowed with permission of parents. To deal before booking! Great hostel! Cozy atmosphere, nice common room area and fully equipped kitchen. Very clean. Owner is very nice and recommended me hikes to do. Nice little restaurant close by. Would recommend! Superb hostel and very friendly people. 5 min from edeka, train main station and local restaurant. Bed and pillow very comfortable. Thanks guys for having me. I stay one day there but next time am staying more. You have also fully equipment kitchen to cook. Great cozy little hostel! “Home” like feel. Full kitchen facilities. Owner was very nice. Only 4 guests including myself were staying there at the time, so not too much interaction (was there 1 night). Very clean, good shower facility in the female dorm. Linens cost 2.50€ (only for short term guests). No personal locks or keys to your dorm, but there were lockers available if needed. I felt very safe tho and no concern for theft or my safety. Would definitely stay here again! Great vibes here! I met plenty of hikers and everyone was kind and welcoming. It's not a big hostel so the common area is confined, but the staff is wonderful, the facility is clean, and it's within walking distance of the train station and the hiking trails. I stayed here for 2 nights (Sunday and Monday) and actually had the 10 bed dorm to myself the first night! The 2 girls were very helpful, friendly and happy to have a chat. The facilities are good, nice common area and decent kitchen. Everything was kept very clean. It was easy to get around to the various hikes using train/bus/ferry or just walking for the ones nearby. Would stay again. Great location for hiking. Clean, friendly, easy walk from Königstein train station. Kitchen for cooking, grocery store is 2 blocks away. Lockers for valuables. Saxon Switzerland is easy to access, Painters Way is amazing definitely worth a visit. Would stay again and recommend. Pretty nice/average hostel, with great location for hiking! Really cosy interior and really enjoyed how incredibly clean it was! The lockers are nice too! Beds have nice curtains. Only downside was that the beds are really shaky to the point when the person below me turns over it would wake me up!